Riding the Tail of the Dragon has been on my bucket list for a while, not only because I’ve read so much about driving in the Blue Ridge Mountains (particularly from author Peter Egan), but because of its legendary status in the sports car and motorcycle world. 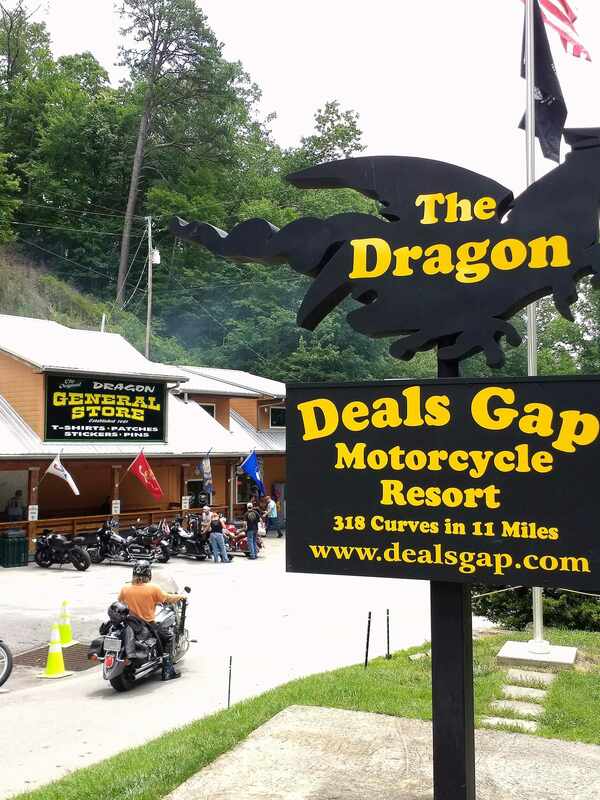 “318 curves in 11 miles,” is a factoid proudly stated on a sign at Deal’s Gap, North Carolina—the eastern terminus of the Dragon. Numerous automotive articles—such as this one by Road & Track—have been devoted to this g-force-inducing road. AOL/Autoblog’s The List even featured driving the Tail as one of its #11—or maybe #318—item a motoring enthusiast must do before giving up the ghost. Flying into Knoxville to visit Maureen in Asheville afforded me the opportunity to tame the Dragon. So did Smoky Mountain Harley-Davidson in nearby Maryville. Renting a Sportster Iron 883—probably my favorite Harley ever since laying eyes on one on the streets of St. Louis a couple years ago—would cost only $25 per day on a weekday, including the Monday during the long Fourth of July weekend. 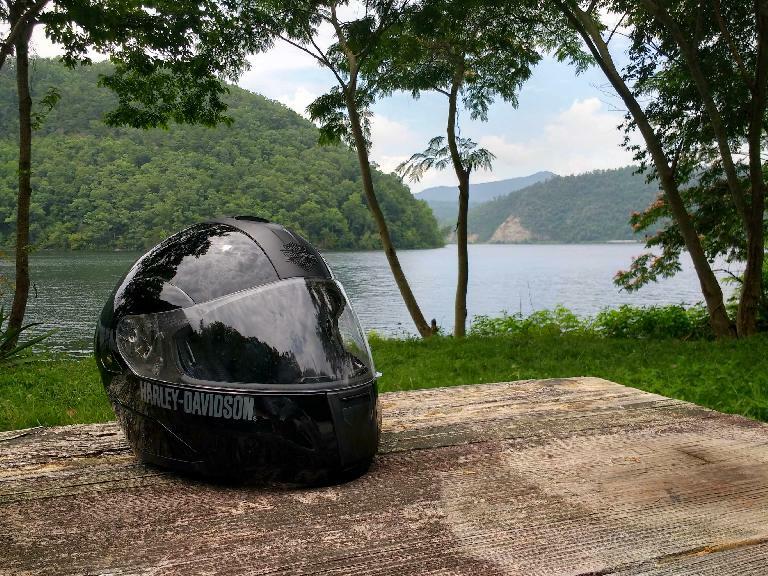 Even with all additional insurance options checked, which in this circumstance were a no-brainer to get, resulted in a total cost of $63.19, including helmet and rain gear. 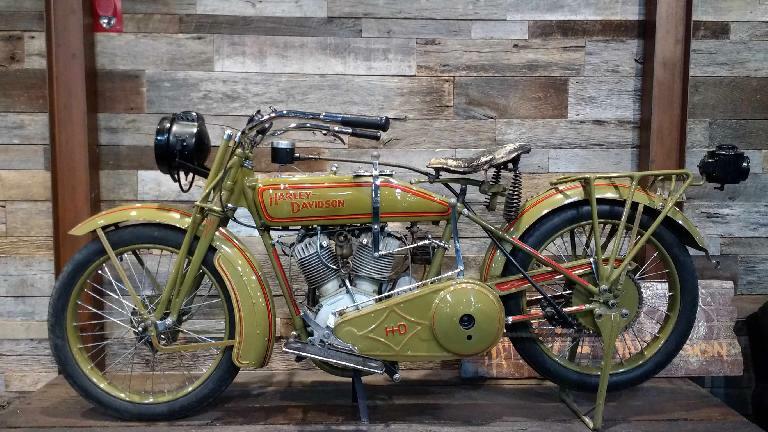 It’s a fantastic deal for a whole day on an iconic motorcycle. “Whole day” actually means 10:00 a.m. to 6:00 p.m., which was good enough for me. 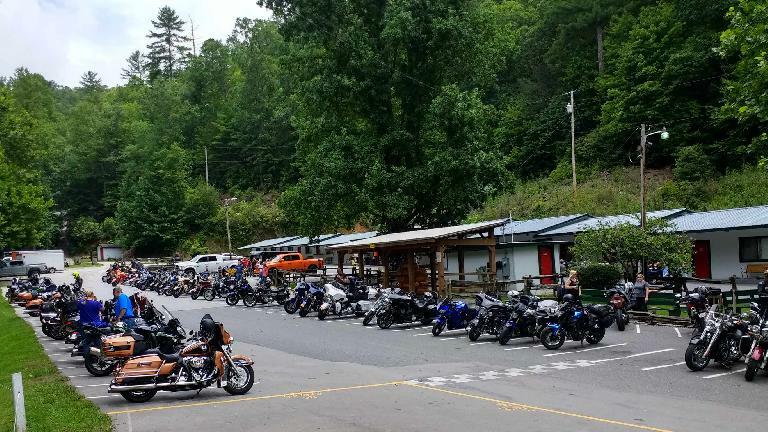 I checked in promptly at the morning hour with Bob, a very friendly and helpful man at Smoky Mountain Harley-Davidson in charge of the rentals. He has been riding motorcycles since 1971, longer than I’ve even been alive, and works at this dealership for fun during his golden years. I can certainly think of worse jobs to have than to work inside a building housing chrome and metal motoring machines, including brand new examples and immaculate pre-owned ones. The rental process entailed providing a credit card in which a $2000 temporary hold was placed in case of damages; signing my life away; getting outfitted with genuine Harley-Davidson helmet, rain jacket and rain pants; and giving a quick demonstration lap around the parking lot to assure the dealership that I could ride the thing. After that, I was free to head anywhere I pleased. So where did I head first? A restaurant with the initials B and K, mainly because it was the first fast-food joint I passed. 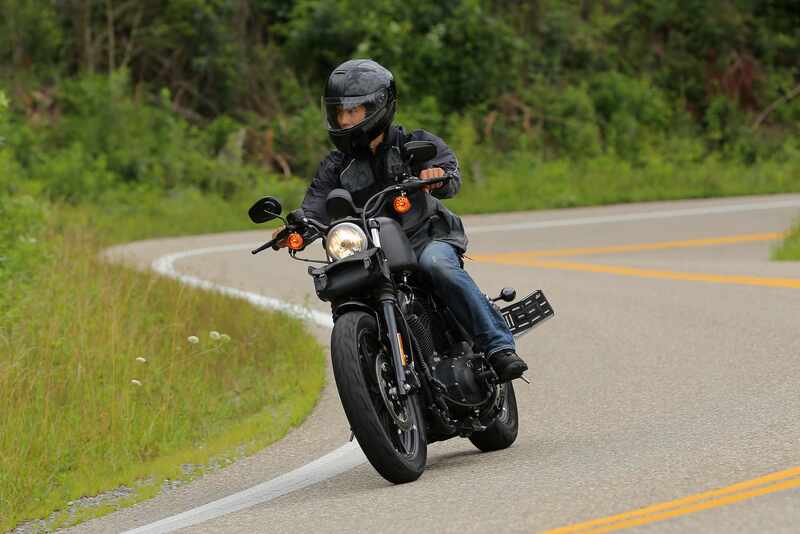 I wanted to take my time getting acquainted with the bike and the controls, including maneuvering around an un-trafficked parking lot. Besides, I needed nutrition and hydration before taking on the Dragon’s Tail. “A strawberry and banana smoothie,” I requested. I also wanted to look at online maps one more time to make sure I knew exactly where I was going, because I would not have the luxury of having Google Maps displayed right in front of me as I normally would in a car. Fortunately, the route was easy enough: get on U.S. 129 heading south, then east towards North Carolina. There was traffic in the town of Maryville but a dearth of it outside the city limits. It was a Monday morning, after all. I expected there to be many tourists due to Independence Day weekend, but thank goodness that was not the case. 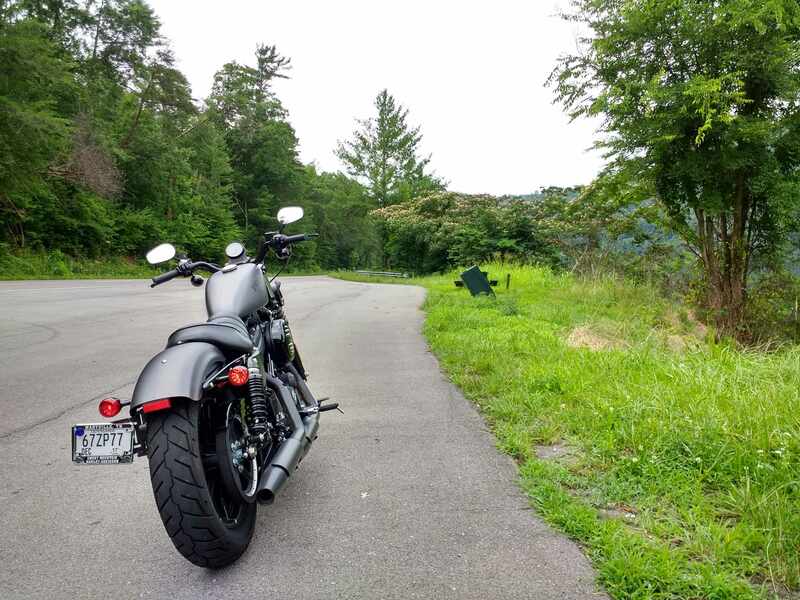 I cruised by charming southern homes, the Foothills Parkway, and Chilhowee Lake. I stopped for photo ops and to take in the scenery. There was no rush—I had all day. Who knows when I would get another opportunity like this. It was only about 32 miles when I encountered a sign saying proclaiming Winding road, next 11 miles. This was it. 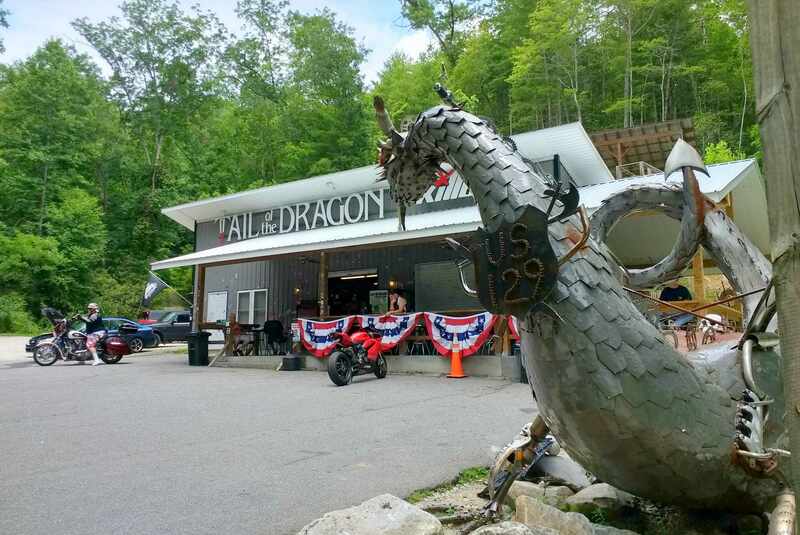 The Tail of the Dragon. Almost as suddenly as I encountered it, a Mazda Miata filled the left and right mirrors. I pulled off the road immediately to let it speed by. The passenger raised an open hand to say thanks. It would certainly not be the last Miata I’d see on these roads. My plan was to give this road two runs: one on the way to Deal’s Gap, and another to backtrack. The intention for the first run was to simply make it through the 318 curves without accident or drama. Actually, that was the plan for the second run too, but I figured I could go slightly faster during that drive depending on how comfortable I felt during the first one. As it turned out, the 11 miles went by quickly, without incident. The posted speed limit was usually 30 MPH, and I found that I was comfortable going the posted speeds even while staying in second or first gear most of the time. On occasion, when a straightaway allowed it, I got into third. The Harley, despite its cruiser roots, felt… good. Maybe not nearly as tossable as my Buell, but it was much easier to swing around than I would have imagined. Cornering clearance was ample, especially for how I was riding. I had no pretentions of being a MotoGP racer, so there was no peg dragging, pipes grinding, or knee touching the ground. After passing the killboy.com (that name!) photographers planted on some of the later hairpin turns, I crossed into North Carolina and arrived at Deal’s Gap with feeling a mixture of excitement, relief, and “that’s it?” It took about 25 minutes to get through the Tail, including a few stops, and it certainly did not feel as hair-raising as often hyped. Indeed, as my friend Bob from the MG Owners’ Club later pointed out, “Remember Mt. Hamilton? 365 turns from Alum Rock Avenue to Lick Observatory. And that was just the front side of the mountain part of the drive.” I would add that Mt. Hamilton also has more dramatic views and less cops while climbing 4000 feet—just to put the slight feeling of “underwhelment” into perspective. Of course, another part of the reason is how safely I was riding. 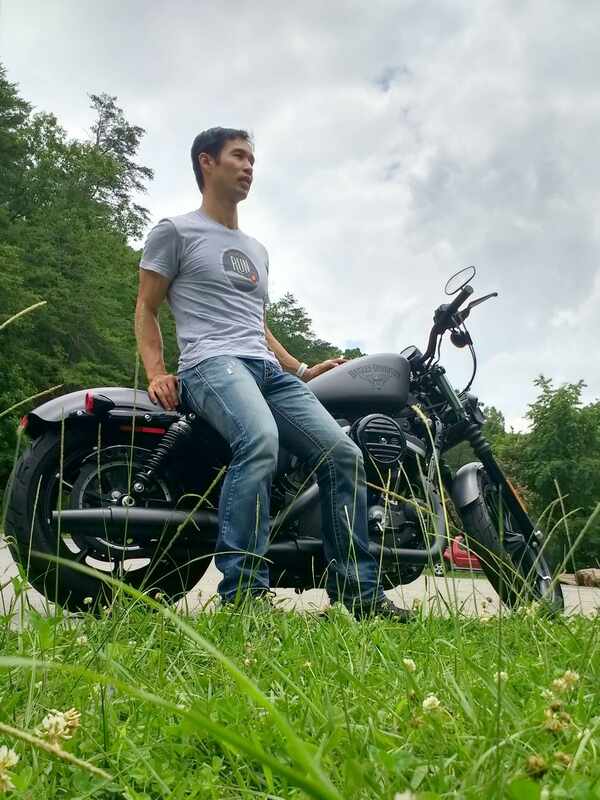 The way I was going, there was virtually zero chance of receiving a speeding ticket, as horrifying as not receiving one may sound to the folks who have aspirations of being the late Nicky Hayden. But my motto can be summed up as be able to ride another day. So the way back was much of the same. Although by that time there were more motorists on the road, and I was less inclined to pull off the road for them. Well, I still did so one time, but only to let them pass and to follow them instead of being pressured into going any faster. I was able to keep up just fine. 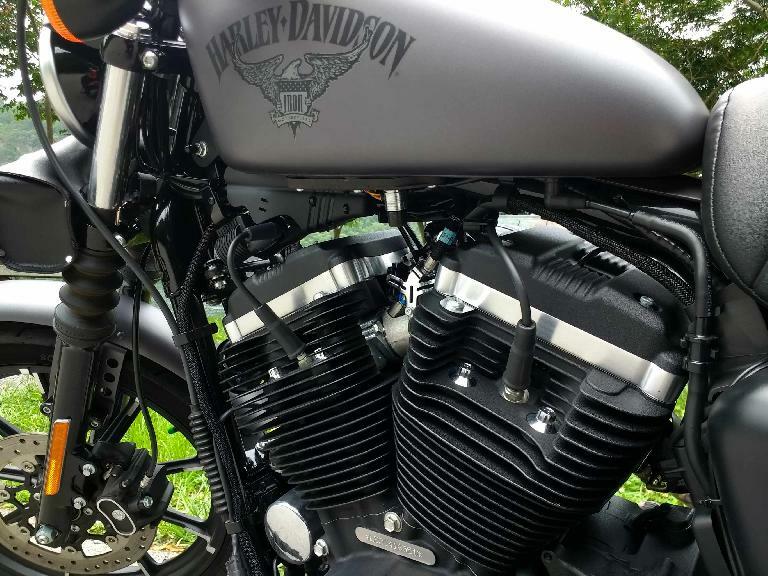 By the time I made it through the Dragon once more I had plenty of time remaining with the Harley and considered my options. Fortunately, one was staring me literally in the face shortly after passing Chilhowee Lake: The Foothills Parkway. A parkway, as I understand it, is a scenic roadway surrounded by protected park land. 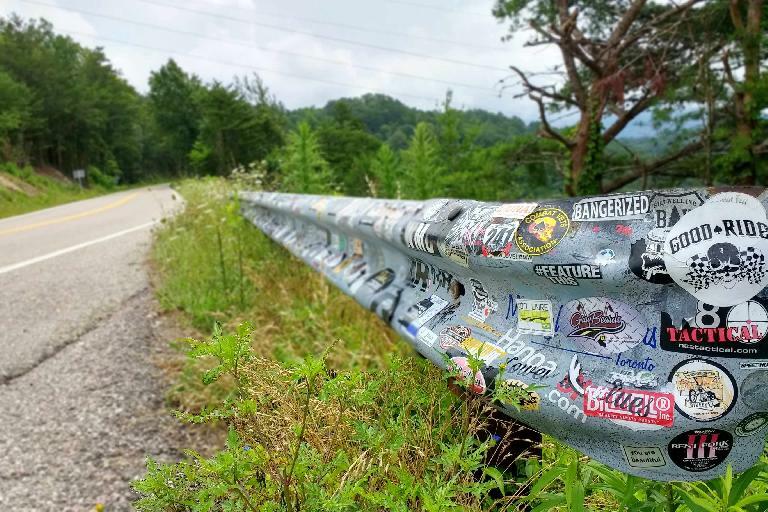 The Foothills Parkway, which has been under construction since 1944 but is only one-third complete, will eventually connect U.S. 129 with Interstate 40. As it is today, it links 129 with U.S. 321. Highway 321 heads west back into Maryville. Perfect. 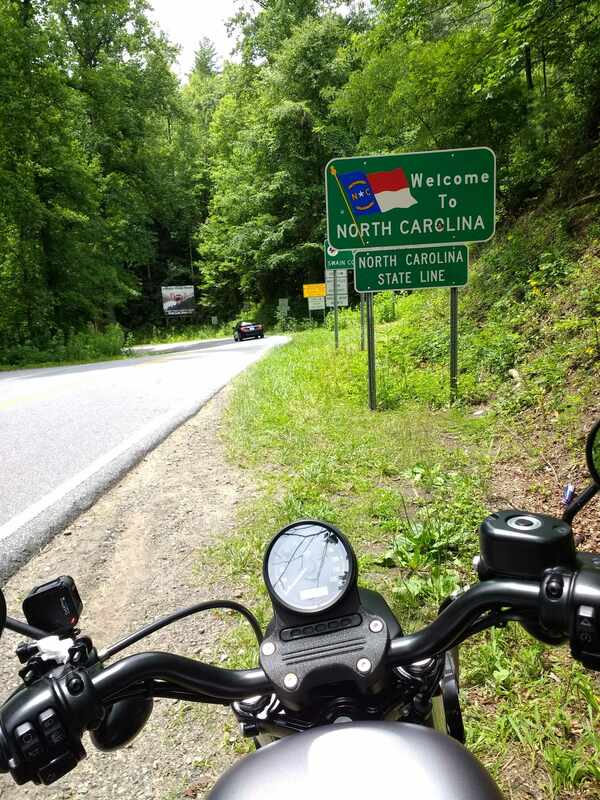 So I rode the Foothills Parkway too, which I thought was even more enjoyable than riding the Tail of the Dragon! There were more awe-inspiring vistas, less traffic, and certainly less opportunities to accidentally dump your bike. If a typical interstate is like porridge too sweet and the Dragon’s Tail too salty, then the Foothills Parkway is Goldilock’s road, just right. It was for me, at least. And a fitting way to conclude the drive and a day in which another item on the bucket list got checked off.